A thunderous 30-yard Thomas Delaney strike helped Copenhagen to a comfortable 4-0 victory over Club Brugge in their Champions League Group G clash. Captain Delaney's superb left-footed effort just after the hour put hosts Copenhagen 2-0 ahead and came in the middle of a 15-minute flurry of goals in the second half. Copenhagen went ahead courtesy of an embarrassing Stefano Denswil own goal before Delaney's effort, a well-struck Federico Santander volley and stoppage-time Mathias Jorgensen header ensured the Danish champions extended their remarkable unbeaten run to 21 games and collected a first group win in this season's competition. It was the least Copenhagen deserved for a dominant display in which they also missed a penalty and spurned several presentable opportunities. Brugge, meanwhile, were left to rue consecutive 3-0 defeats in Group G and are now rooted firmly to the bottom of the table. Copenhagen started the game like a team in form, dominating possession and looking for opportunities to get beyond Club Brugge, who were happy to sit back and look for opportunities to break. The away side almost made the early breakthrough on the counter, when Jose Izquierdo wriggled free on the edge of the box and fired just wide of the post. Brugge's defensive organisation was almost undone a few minutes later due to a goalkeeping howler from Ludovic Butelle. Butelle inexplicably came off his line in an attempt to claim a cross, but got nowhere near it, allowing Andreas Cornelius' header to loop over him, only for his blushes to be spared by Benoit Poulain's hacked goal-line clearance. Brugge then wasted a fabulous opportunity to break the deadlock midway through the first half, but the unmarked Claudemir could only head straight into Robin Olsen's grateful arms from close range. Butelle made amends for his earlier error with a smart series of saves as the first half drew to a close, first palming away a dipping free-kick and then leaping to keep out a bullet Federico Santander header. But it was in the second half that the goals began to flow. First, a low cross from the right was turned into his own net by Denswil. The defender, under no pressure at all, stuck out his left leg and directed the ball past the helpless Butelle. Denswil's horror show was made even worse just minutes later when Copenhagen were awarded a penalty after his high boot caught Santander's head as he stooped to meet a cross from the right. But Butelle rescued him when he saved Ludwig Augustinsson's subsequent spot-kick, diving down low to his right to palm to safety. Just three minutes later, skipper Delaney did extend their lead with a rocket left-footed strike from a full 30 yards out, catching the ball on the half-volley and smashing it home off the post. Santander then put the result beyond doubt after 69 minutes, catching a corner on the volley and firing into the roof of the net with his left foot. 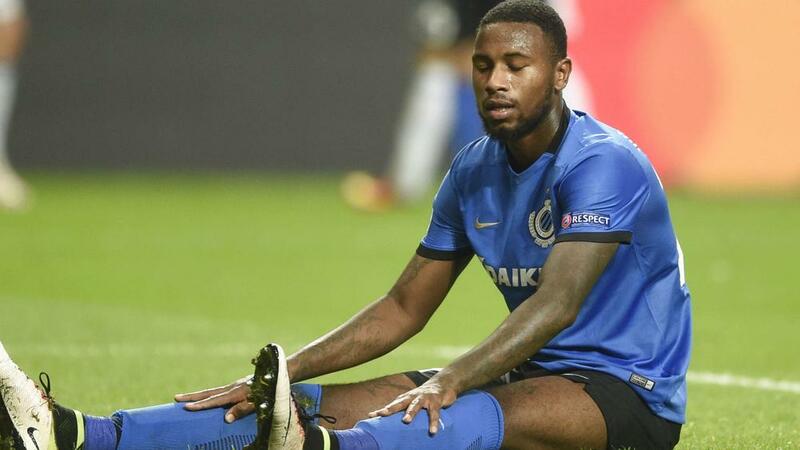 The rout was sealed when centre-back Jorgensen rose highest to nod in a corner swung in from the right to make it 4-0 and complete Brugge's miserable evening.